AIM was started in 2017 when Dr. Perez wanted to return to Taos to provide medical care and expand addiction treatment services closer to her home. 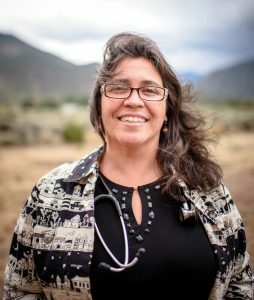 Structured as the medical arm of TriCounty Community Services and part of it’s new and expanded vision of Integrated health and Wellness , AIM brings Dr. Perez’ diagnostic approach to medicine, her holistic view of well-being and her respected model of addiction treatment to Taos County. The Alchemy Model for the treatment of opiate dependence in a group setting is available in Taos through Alchemy Integrated Medicine. The Alchemy Model is also offered in Rio Arriba County at Las Clinicas del Norte in Abiquiu. Click here for more information. Dr. Perez is board-certified in Family Medicine with specialized skills in treating drug addiction. She has been providing comprehensive primary care as well as medication-assisted therapy for the treatment of opiate use disorder and alcohol addiction in Northern New Mexico since 2013. After working as a secretary and traveling the world, Dr. Perez returned to school at the age of 30. In 2006, she graduated from Stanford University School of Medicine. With plans to practice “where there are no doctors”, she attended residency at Contra Costa Regional Medical Center in Northern California; a program known for training physicians to work internationally in underserved areas. Her outpatient clinic was located in Richmond, California, the #6 murder capital of the country per capita. In response, she founded Frontline Richmond, a non-profit committed to reducing gun violence, educating teachers, parents and community members on PTSD and providing community supports to address mental illness. After residency, in 2009, she relocated to her mother’s home state of New Mexico. For 8 years she has worked throughout the state including Grants, Artesia and Questa providing primary care. Always with an interest in addiction medicine, she began treating patients individually in Questa in 2013. At the same time, she achieved significant success treating CEOs, lawyers, physicians, celebrities for addiction in private residential treatment. Additionally, she served as a consultant, establishing medical standards for emerging programs. In 2015, Dr. Perez brought her knowledge gained in private practice to her rural clinic patients and began her novel group program at Questa Health Center. Dr. Perez has established a unique program for treating addiction. Intensive, Integrated, Verified and Group therapy-based, her work has been acknowledged both locally and nationally as a model of current “best practices” for addiction treatment.